choose an option 8 ft. x 8 ft. 8 ft. x 12 ft. 8 ft. x 16 ft. 8 ft. x 20 ft. 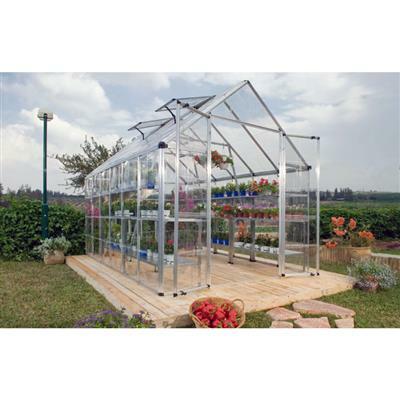 The Snap & Grow Plus greenhouse includes all of the features of our standard model in a 8' wide configuration. 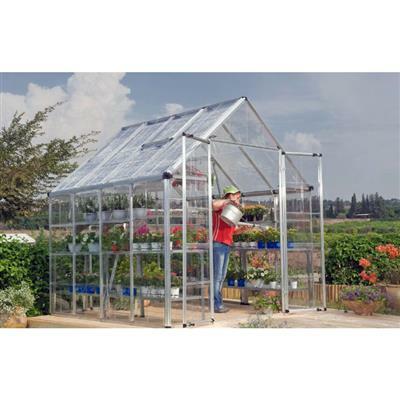 The SmartLock connector system makes this hobby greenhouse one of the quickest and simplest on the market to set up. 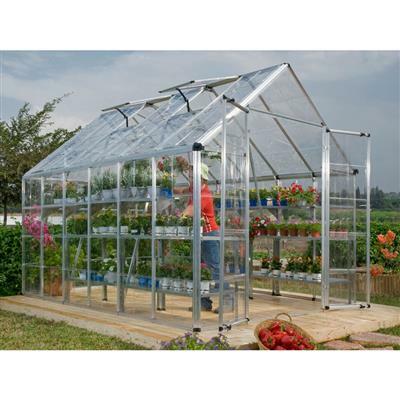 The tough, crystal-clear SnapGlas panels bring in a maximum amount of light that your plants will surely enjoy. Large, double-doors and an adjustable roof vent provide flexible ventilation. An adjustable, preassembled roof vent and tall, double-doors provide excellent ventilation. 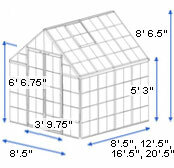 I had no problem putting the greenhouse together - all the parts were there, and the instructions were clear enough for me. HOWEVER, the single layer of plastic is almost no insulation - all it will do is keep wind and rain off of your plants. 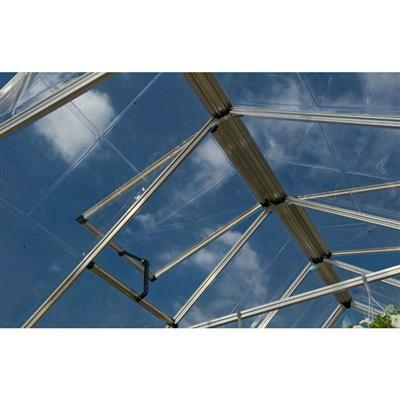 If you want insulation, go for one of the greenhouses with double or triple wall polycarbonate walls. Great greenhouse, hard to put together but we did it. Was missing a few screws. pieces were missing, shipping took longer than what was said and I lost half of my crop in waiting. It didn't go together half as easy as you describe. wasn't even worth calling to complain because I new it would be too long of a wait and not worth my time money or effort. was very disapointed with the product. the pannels were good but the plastic pieces that hold the greenhouse together broke after not even one day of being put up. would suggest that the company look into using metal to hold the pieces together rather than plastic. would suggest to anyone buying the product reinforce all plastic ends with a metal rod for strength. It took 2 people a full 2 days to build my snap and grow plus. We bought the 12 foot model (4' extension kit). It went together well without any problems. We completed the project in October. Although we didn't get to use it upon completion, we got to watch how it stood up to winter over the next several months. It is now near the end of February 2014. When the winter winds picked up the doors were easy to blow in (inside the greenhouse) which bent the hinge bracket that attaches to the door (not the frame). 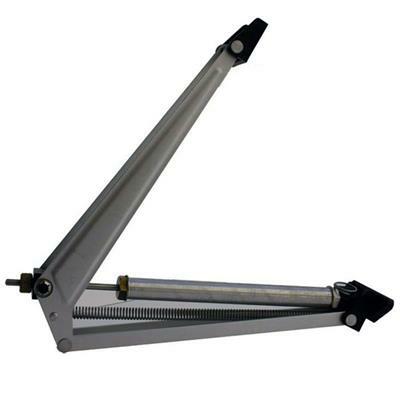 We had to order 4 new hinge brackets. The wind also blows the roof vents open (even though the arm brackets were tightened down securely on the locking mechanism located in the middle of the arm bracket). One of the vents was blown completely off the greenhouse one evening...and yet remains to be found. I'm going to have to order a new one because I have no idea where it went. 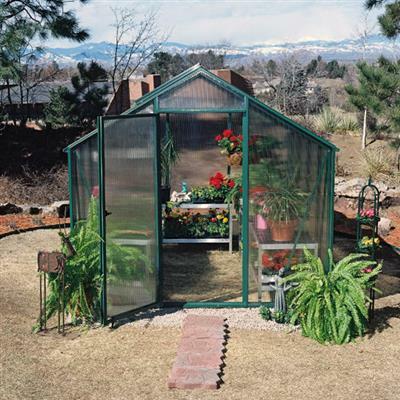 My recommendation to people is to shrink wrap the whole greenhouse for the winter months because otherwise you'll be picking up the pieces. 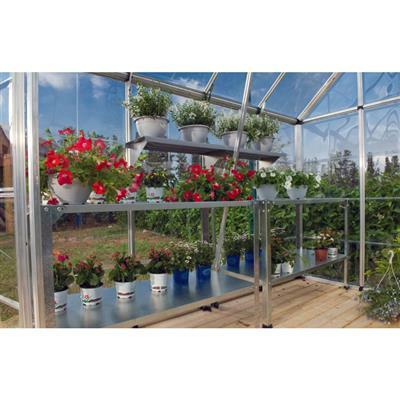 I will write another update near the end of summer to let you know how the actual use of the greenhouse has worked. Went together fairly easy, only a couple glitches, but after studying the picture for a couple of minutes we figured it out. It does take two people to put it together. This is a marvalous greenhouse. The engineering that went into this just astounded me. Everything fit just like the instructions said. Be sure to read and understand the instructions before you start. It took 2 people about 6 hours to complete. 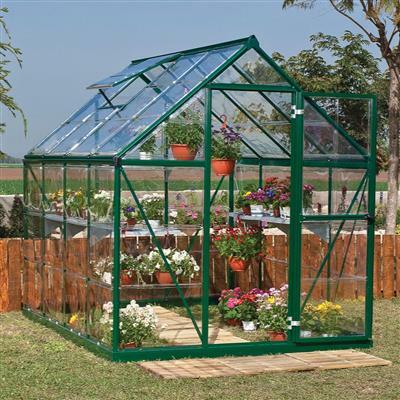 This greenhouse was very easy to assemble. The hardest part was laying a level foundation. I assembled most of it on my own but you will need help during some parts. I had one part missing from my kit the people at palram got the part shipped out to me before I got to that step. I would buy this kit again. 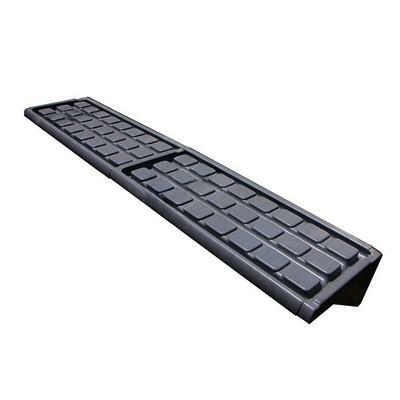 While shopping thru your site was easy and convenient, the product was less than expected. Construction directions were in only pictures. build took three days with two people, one a state licensed builder, and was very difficult to complete. Vent windows still don't fit! 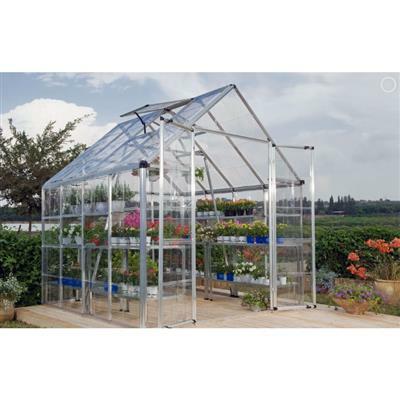 Would NOT buy another Snap and Grow greenhouse, even if the price was lowered to $5!! I just finished assembling the Snap and Grow plus and was very pleased with the process. All the parts were clearly numbered and the pictorial instructions were very easy to follow. It took a full two days for the complete process but nothing was too difficult and some parts really do require 2 people. 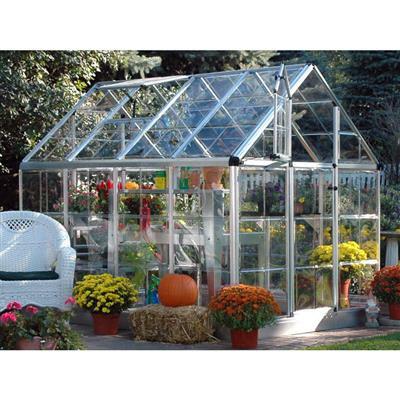 From all appearances this greenhouse will meet my needs for a hobby greenhouse to a tee. It is very sturdy once all the additional reinforcements are added and should have no trouble with the occasion windy thunderstorm we have here in Georgia. 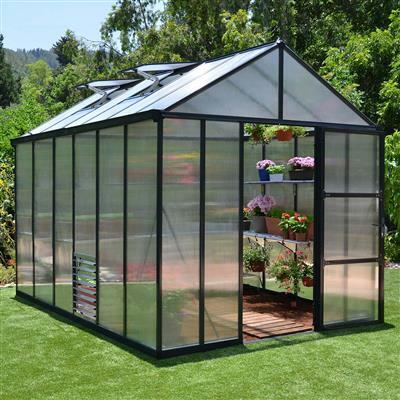 I've been shopping for a small greenhouse for quite a while and I think I got a great greenhouse a wonderful price when you compare to other similarly sized units on the market. I recommend it highly.